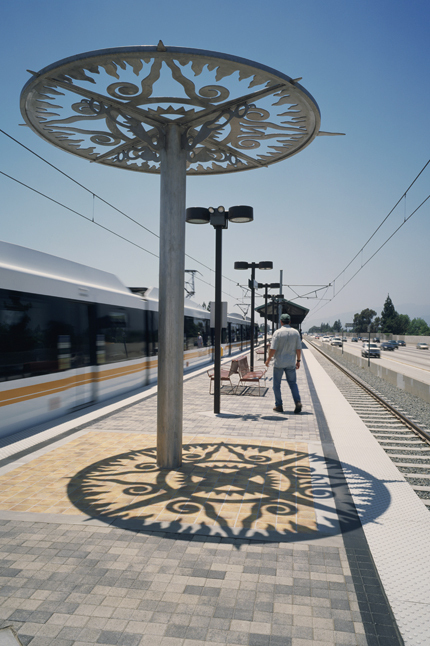 Passengers are greeted at Allen Station, situated along the 210 Freeway median, by Michael Amescua’s dramatic grillwork adorning the street-level entrance. Amescua’s series of steel panels, created in the tradition of papel picado, or punched paper, are painted a deep forest green with brushed stainless steel and red enamel accents, and forms a relief against a golden ceramic tile wall. Papel picado is a folk art that can be traced back to pre-Columbian times, when Mexicans used cutout bark paper depicting a variety of human and animal spirits as offerings to the gods, as a tribute to the Aztec emperor, Moctezuma II, and as decoration in their temples and palaces. Amescua’s panels depict a family of figures and a dog in a mystical romp through the region’s rich flora and fauna—an idyllic background scene that includes a sun and moon, stars that morph into birds, palm and pine trees, mountains and arroyo, river boulders, and rail tracks. These images mimic the surroundings that can be viewed from the station platform above. Another panel of cutout flowers demarcates a corner alcove above the entrance stairway. On the platform level, a 10-foot tall stainless steel “Sun Marker” fashioned in the same cutout tradition hovers over passengers, casting shadows on the gold slate pavement below while heralding the summer and winter equinox. The early Mesoamericans were said to have used a solar-lunar calendar, and the sun marker was an important tool in determining the movements of the sun and the cycles of the moon. MICHAEL AMESCUA was born in Morenci, Arizona and currently lives in East LA. Amescua obtained a degree in Anthropology from Occidental College, specializing in Pre-Columbian myth and ritual, and is a long time artist in residence at Self-Help Graphics in East Los Angeles. Working in steel as a primary medium, he reinterprets traditional art forms and his pieces can be found in collections at UCLA, the Rincon Indian Reservation, and the Wilfredo Lam Museum in Havana, Cuba.